The Fluidmaster 400C Fill Valve and Flapper Repair Kit is the No. 1 solution to fix noisy and running toilets. A complete fill and flush toilet repair kit that includes the trusted Fluidmaster 400C toilet fill valve and the Fluidmaster 501 2 in. flapper. With quick and easy installation and a 5 year warranty this kit is perfect for a DIY upgrade, best with 3.5+ GPF toilets. This replacement toilet repair kit solves most common toilet fill problems, with the proven 400C toilet fill valve and its anti-siphon design. While the reliable 501 2 in. flapper helps prevent leaks, with a solid frame build, and corrosion resistant materials. 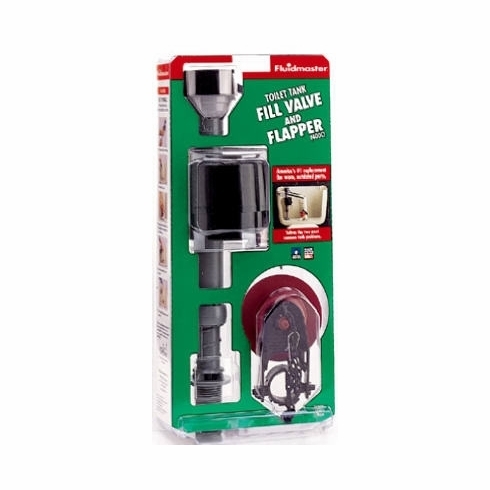 For a quick DIY solution for both fill and flush problems Fluidmaster’s 400C Toilet Fill Valve and Toilet Flapper Repair Kit is the top choice. Enhance your toilet's overall performance with one proven Fluidmaster kit. 400C toilet fill valve easily adjusts between 9 in. to 14 in.